In order to get the option to manage users, computers, etc in AD you need to have the AD tools installed. The first step is you need to install the Remote Server Administration Tools for Windows 7 with SP 1. The second step is to enable the AD tools in control. 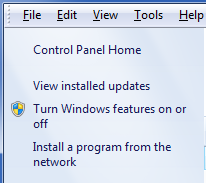 From the control panel, click Programs and Features. 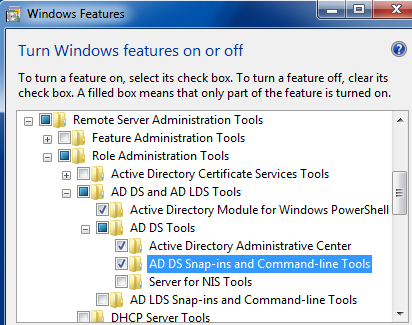 Under Remote Server Administration Tools –> Role Administration Tools, select AD DS and AD LDS Tools. 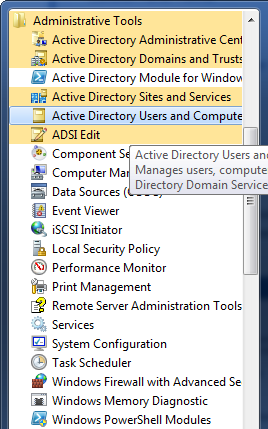 Select the Active Directory Administrative Center. This entry was posted in Active Directory and tagged Active Directory, Active Directory Administrative Center, Active Directory Application Mode, Microsoft, Microsoft Windows, Operating Systems, Start menu, Windows 7. Bookmark the permalink.